South Korean Government ruled that ‘hydrogen economy’ as an important method for converting energy paradigm and is planning to promote hydrogen economy as a new driving force by making huge investments. It is going to apply hydrogen to 3 energy basic plans by end of this year and incorporate ‘Hydrogen Economy Act’ to its system. South Korean Government newly appointed data, AI (Artificial Intelligence), and hydrogen economy as ‘3 strategic investment’ fields and it is planning to invest $8.83 billion (10 trillion KRW) for the next 5 years. It is also going to invest $3.09 billion (3.5 trillion KRW) into ‘8 leading projects’ in 2019. It is also expected that South Korean Government will invest more than $17.7 billion (20 trillion KRW) into budget for R&D in 2019. Although South Korean Government is working on improving energy of South Korean companies by supporting innovative growth, it will be inevitable for South Korean Government to avoid criticisms that will say that South Korean Government prepared initial policies hastily. Also, there will be controversies involving its policies leaning too much on large corporations. 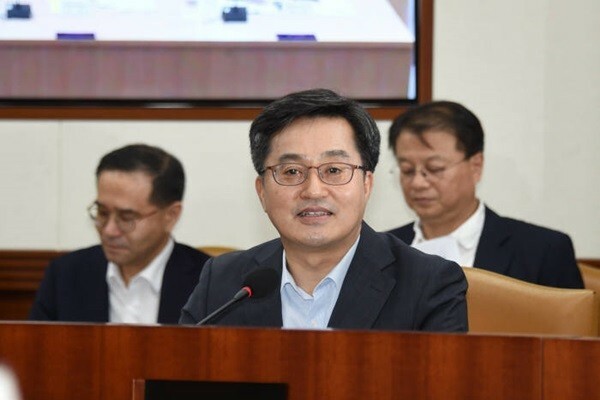 Deputy Finance Minister Kim Dong-yeon, who is also the minister of Ministry of Economy and Finance (MOEF), held a meeting for ministers who are associated with innovative growth and finalized on ‘direction of strategic investments for innovative growth’. South Korean Government has decided to implement ‘platform economy (infrastructure, technology, and ecosystem that are absolutely necessary for many industries)’ to accelerate innovative growth, constitution of South Korean economy, and innovative ecosystems. As a result, it selected hydrogen economy, data, blockchain, and sharing economy, and AI as 3 fields for strategic investment. It has also decided to train talented individuals at the same time and invest huge amount of its budget. South Korean Government decided that hydrogen economy will be an important platform to convert energy paradigm and to promote future industries. According to McKinsey, hydrogen-related industries will be worth $2.5 trillion by 2050. South Korean Government is going to apply hydrogen to 3 energy basic plans by end of this year and prepare legal and systematic foundations by establishing Hydrogen Economy Act by end of next year. It is going to invest $61.8 million (70 billion KRW) into demonstrating R&D per hydrogen economy value chains and $17.7 million (20 billion KRW) into establishing production bases. South Korean Government is going to apply 15 projects to budgets of Ministry of Science and ICT, Ministry of Trade, Industry and Energy, and Ministry of Land, Infrastructure, and Transport in 2019 and develop high-efficient storage and transport technologies and install verification plants. It is also going to establish 30 hydrogen production bases at major gas suppliers. It will prepare early mass-production system of hydrogen bus and operate 30 hydrogen buses in public sectors n 2019. Until 2022, it is going to push for development of hydrails. “We will be able to be a leading hydrogen economy country based on commercialized technologies if we prepare everything systematically.” said a representative for MOEF. South Korean Government is going to invest $168 million (190 billion KRW) into establishing foundations for Big Data, AI, and blockchain. It is going to establish Big Data network by opening up data and promoting active transactions with Big Data platforms of 10 major fields at the center. It is also going to invest $115 million (130 billion KRW) into resolving data divide (gap) and invigorating sharing economy. South Korean Government is going to invest $79.5 million (90 billion KRW) into training talented individuals. It is going to train total of 10,000 talented individuals within areas such as AI and Big Data that are related to Industry 4.0 during a 5-year period. Its goal is to establish a separate non-degree process (tentative name: Innovation Academy) and train top individuals in relevant fields. It is expected that South Korean Government will bring a tremendous amount of help to improving market activities as it pours in huge amount of investments into innovative growth. Level of expectations from scientific technology industry has gone up as well as South Korean Government is expected to invest more than $17.7 billion (20 trillion KRW) into R&D budget, which had not shown much growth for past 3 years, in 2019 alone. However, reduction of credibility towards policies will be inevitable as South Korean Government modifies its policies in just 9 months since it announced its 8 leading projects back in November. Also, some are concerned that South Korean Government will focus on large corporations over small and medium companies when it comes to hydrogen economy and bio-health due to their characteristics.